Ben reaches breaking point when he believes Shirley has overheard a conversation between him and Phil about Heather's death. Derek holds a party to introduce Alice to the family. Ben tries to persuade an intoxicated Phil to go to Grant’s, Phil refuses. In a drunken stupor, Phil mutters about Ben, who locks him in. Ben talks to Shirley about Phil’s drinking. Phil breaks out and tries to buy vodka from the Minute Mart. Kim boots him out. 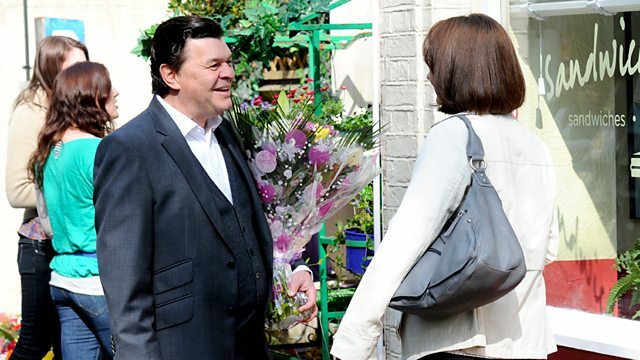 Ian suspiciously watches Mandy with Phil on the market and accuses her of seeing him. Ben discovers Phil’s missing and finds him outside R&R. Furious, Phil shoves Ben into an alley, slurring it’s Ben’s fault he’s ruined Shirley’s life, and reveals Kathy feared Ben would turn out like Phil - but Ben’s worse. Ben flees, colliding with Shirley. Afraid she’s overheard, Phil tries to talk to her, Shirley resists. A policewoman intervenes, watched by Ben. Shirley tells Phil she heard everything. Ben bursts in on Ian, confessing he killed Heather. Tanya’s annoyed when Max agrees they’ll host a party for Alice. Derek awkwardly invites Alice, and is touched when Dot and Cora prepare party food. At the Butchers’, Derek digs out cash from the sofa cushions, revealing a stash of Absinthe. Derek notes a strange car on the Square. He’s putting the rubbish out when police arrive with a search warrant for stolen booze. At Max’s, Alice arrives amidst a family argument. Abi worries when Jay avoids Ben’s calls. Cora gives Jay hay fever medicine. Max suggests Jay stay with Dot, claiming Abi’s distracted from her revision. Jay lies he’ll stay with a mate. Jay swipes beer and Abi finds him later in the park, drunk. Jay miserably slurs to a shocked Abi they didn’t mean to kill her. Ray’s missing Morgan. Kim plots to cheer him up and answers the door in a raunchy army uniform. She’s mortified Ray has Sasha in tow.